THE contamination of strawberries now appears to be impacting six brands and four states in Australia. 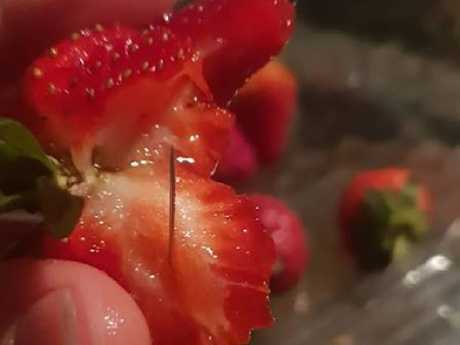 Police have been investigating this week after sewing needles were found in strawberries sold in Victoria and Queensland but the crisis has now spread to NSW, ACT and South Australia. It is now believed the contamination may affect six brands of strawberries: "Berry Obsession", "Berry Licious", "Love Berry", "Donnybrook Berries", "Delightful Strawberries", and "Oasis". These brands are believed to be sold in stores in NSW, Queensland, Victoria, and the Australian Capital Territory. So far NSW Police Force has received reports of contaminated strawberries purchased at supermarkets at Tweed Heads, Taree, and Wingham. It follows reports of contaminated strawberries in Queensland and Victoria. 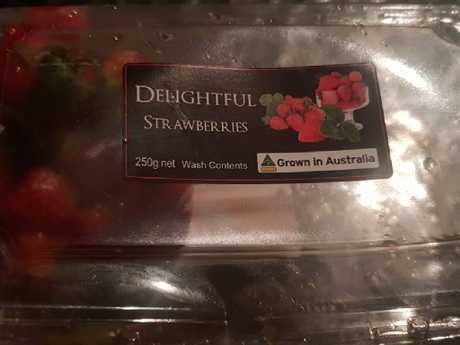 It's unclear whether the NSW strawberries originated from a Queensland-based supplier that is at the centre of the scare, or if they are copycat incidents. Police are urging shoppers to cut up strawberries before eating them. This afternoon South Australian residents were drawn into the contamination scare after the Donnybrook brand of strawberries was found to be impacted. Health officials in Queensland confirmed the Donnybrook strawberry supplier had been hit with three credible complaints, prompting a call for retailers to immediately remove the company's fruit from sale. It follows similar advice for Berry Licious and Berry Obsession brands of strawberries, after six cases of contamination in recent days in Victoria and Queensland. 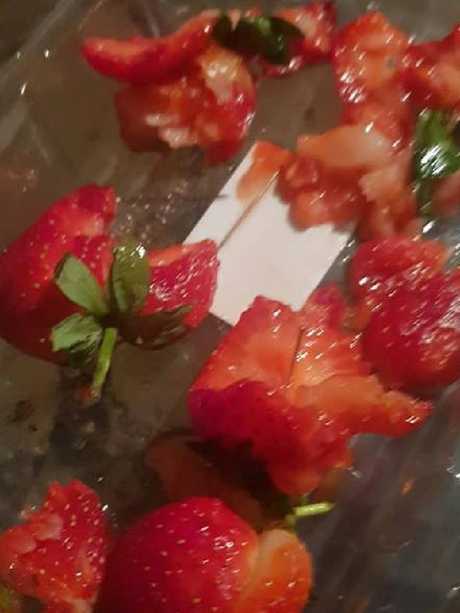 Earlier today, a mum in New South Wales said she found needles hidden inside a punnet of strawberries bought at Coles, in the first incident of the sabotage in the state. Chantal Faugeras said she found three needles after buying the fruit from Wingham Coles, on the mid-north coast. Ms Faugeras shared the discovery on Facebook and was met with shock and outrage, with commenters questioning "what is wrong with people?" and saying the dangerous saga was "getting crazy". She said the first needle was discovered when her 10-year-old daughter bit into one of the strawberries and found the hidden item on Wednesday. After checking the rest of the punnet she found two more needles. "We found three all up in one punnet. My ten year old found the first after biting into one and brought the rest to me," she told news.com.au. "I was shocked to see a pin sticking out of the one she bit and decided to squash the others in case and that's when we found two others. "We brought 2 punnets from Wingham Coles. Kids chuck them in so not sure what both brands were … only complaint was tonight from 'Delightful' strawberries," she wrote. "We found 3 pins inside 3 strawberries. Please be careful and crush them up before eating or just chuck them out." 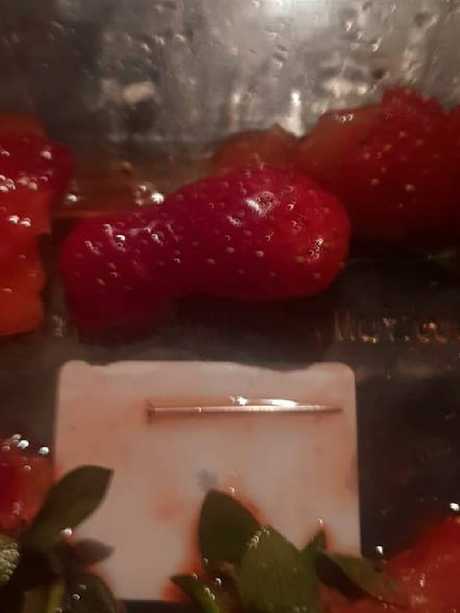 She said the pins were the type a "tailor would use" and didn't go all the way through the strawberries, making them impossible to see unless you cut into one. "They went through the green top and half way through strawberry so if you ate whole would not know," she said. A spokeswoman for Coles told news.com.au the supermarket giant was working with police and other authorities to investigate all of the incidents. "Coles takes the safety of the food we sell seriously and we are working with our suppliers, police and state health regulators to investigate," a statement from Coles said. "The safety of our customers is our priority and anyone concerned about their health should seek medical advice. Queensland Health has warned people should cut up all strawberries before consuming them." News.com.au has contacted NSW Police for comment. There has been no other reports of needles found in NSW and people were understandably disturbed by the discovery. "This is a great big worry. I bought 2 punnets for my husband at Aldi just before I came into hospital. Hopefully he thinks to check them out," one person commented. "Sent my 7 year old to school with this brand strawberries this morning. Just phoned the school after a friend had warned me & the office ladies are straight onto it thank god," another said. Amalia Schermerleib comments, "OMG!!! This is just getting f**king crazy." 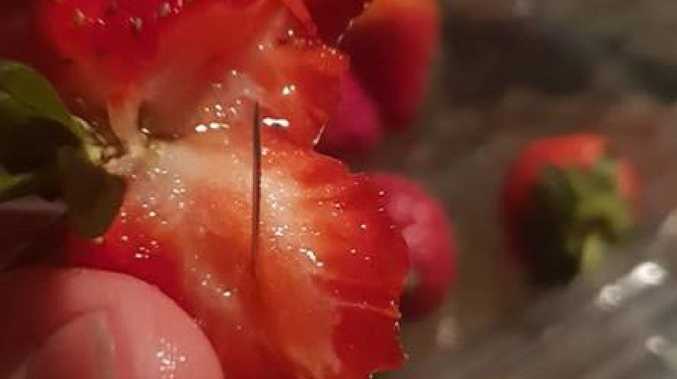 There have been concerns that copy cat could be replicating the previous incidents of sewing needles being hidden inside strawberry stocks from a Sunshine Coast-based supplier. Queensland Police acting detective chief superintendent Terry Lawrence told reporters on Thursday afternoon that a Coles employee in Queensland town of Gatton bought a punnet of strawberries and found a small silver rod inside. The item was lying on top of the punnet and had not been inserted into the fruit. In all other reported cases the pins were found inserted into the berries. Four of the reported cases where pins were found inside the strawberries came from the brands Berry Obsession and Berry Licious. 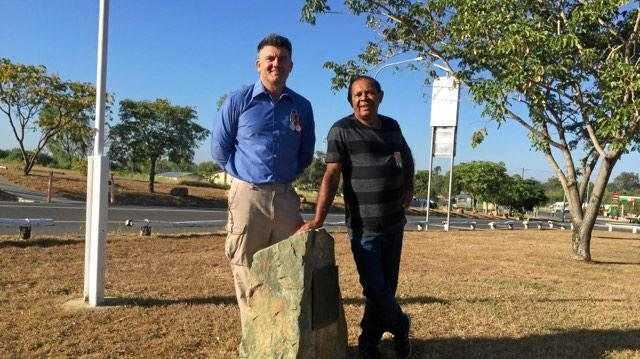 The Warmuran farm that supplied the berries was inspected by Queensland Police and Australian Border Force officers yesterday. Consumers in Queensland, Victoria and New South Wales have been urged to throw out or return berries bought in the past week and cut up any strawberries before eating them.